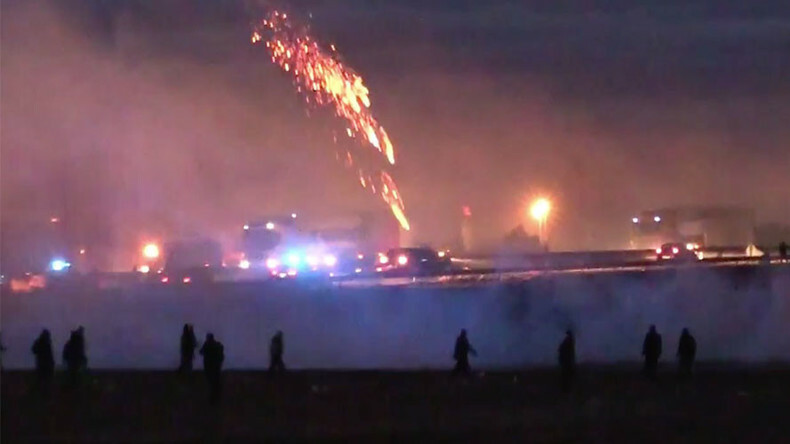 Around 150 migrants, some armed with iron bars, have attempted to block or climb lorries traveling towards the Eurotunnel, as clashes with police continued into the night in chaotic scenes surrounding the Calais refugee ‘Jungle’ camp in France. Police were called to the area after refugees, enraged by an earlier eviction, attacked trucks with stones, debris, and iron bars. Officers used flash grenades and tear gas to stop refugees from reaching the motorway and climbing onto the trucks. The clashes came following a day of confrontations between police and migrants after authorities proceeded with the dismantling of parts of the camp and bulldozed them to the ground. The initial disturbance began when authorities arrived at the refugee camp on Monday morning, informing residents that they had to leave the area within the hour, or face arrest. The construction workers then moved in to dismantle the makeshift shelters in the southern part of the slum, home to 800 to 1,000 migrants. By early afternoon, angry migrants and members of the No Borders activist group set fire to some 20 makeshift shelters and began throwing projectiles at riot police. Police responded with tear gas. Last Thursday, a local court ruled that the southern part of the camp should be demolished. French Interior Minister Bernard Cazeneuve reassured those losing their shelter that the local government should cooperate with activists who are helping to accommodate those refugees left without homes.